1. Loop each piece of licorice lace and poke into the flat end of the spice drops. 2. Using a knife, slice each spice drop, lengthwise, so that they lay flat; trim off the round tip and set aside. 3. Spread frosting on the bottoms of the vanilla wafers; on 12 of them place a gum drop near the edge, loop pointing out, and sandwich between the remaining wafers. 4. Decorate with icing and sprinkles and serve. 1. Using a knife, cut the treats to form triangles. 2. Draw garlands on each using the decorating icing and finish with M&M Minis and other decorations. 1. For each snowman, push three marshmallows onto end of skewer or lollipop stick. 2. Microwave white-chocolate and shortening in a microwave-safe dish on medium-high for one minute. Stir. Microwave in 10- second intervals until smooth. 3. Holding the skewer or stick, spoon the melted mixture over the marshmallows until covered; place on wax-paper lined cookie sheet. 3. Top each with a Necco Wafer and set aside until chocolate has hardened (about 30 minutes). 4. Pull the Twizzlers two pieces at a time and wrap around the marshmallows to create a scarf. 5. 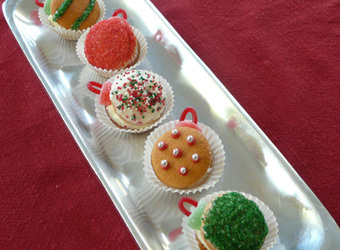 Add a dab of decorating icing to the top of each Necco Wafer and top with a coordinating spice drop to form snowman hat. 6. Using the decorating icings, draw on the eyes and mouth (black), carrot nose (orange) and branch arms (brown). 7. Serve individually wrapped in cellophane (optional). 1. To create your reindeer face, draw eyes on each pudding cup and glue on a red pompom nose. 2. Break the pretzels to look like reindeer antlers. 3. Remove pudding cup, top each with two antlers, and serve.